He's sought after because his skin texture is pink and so it makes him look like a flamingo/lawn ornament. If i had one, i'd name it "Divine"
The best name I've seen for this guy is Floyd. Back in the day we had a High Warlord running around with "Pink" Floyd. He's bright pink, you can't miss him! I'm a hunter so I tamed Mazzranache, he comes with the cower skill lvl 1. He looks like a combat flamingo, very amusing! This is me and my tamed Mazzranache. I found him just west (a litle noch north) from the venture & co. water well. He owns, really. Lots of HP, nice DPS and skills, nad he looks really cool! My Blood Elf hunter has this guy and he's a pretty decent fighter. I get a heck of a lot of compliments for him, too. But I just think it is going to be really cool when I hit level 40 and get a mount because the BE mounts are these striders too. Anyway, I camped for him at 38,44 right next to the road, and I saw him spawn slightly northwest of where I was. Here's a compilation image of where I found him, what he looks like next to me, and his starting attributes. I, too, got him at the tender level of 10 (after making 3 tries to get him, dying once and going crazy for about 1/2 hour looking for him again lol). I'm also a blood elf, and I'm thinking of how wonderful he'll look next to my mount when I get it, as well as how peeved off the alliance is going to be when I pwn them at level 70 with a buff pink flamingo! My best advice for those of you looking to tame him is to make the attempt at about 4 a.m., that way there won't be as much competition from other people who want to kill or tame him, and bring healing potions, because this bird hits hard and doesn't tame very easily. He roams around south of Thunder Bluff, not too far from the path. Found him today at 41.43. In case you didn't know, hunters, pets shrink to your size. Mazzy won't stay this big if you tame him. She spawned in half an hour at about 38,44. I've been camping this bird for about an hour now. Does anyone happen to know what her respawn time is? I got it as a joke but now I'm attached to it and its become my main pet. Never gets boring to look at. 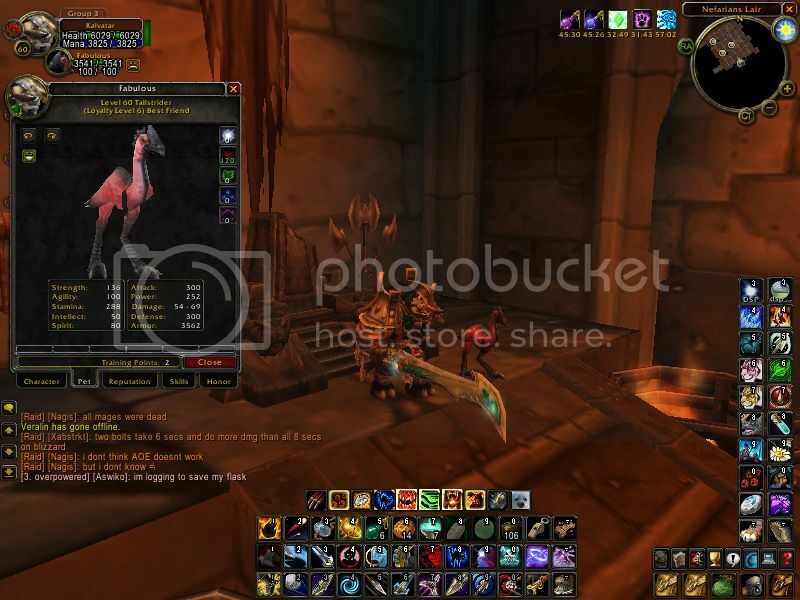 Watching clothies run from it in BGs is priceless. I got him tonight as my first pet which was pretty freakin awesome. My friend came on as his lvl 19 undead priest and shielded me so I could get him. I wandered Mulgore after that for HOURS. When I resurrected, she was nowhere to be seen so the hunt was on! I looked everywhere and was just about to give up hope when I read what a few others had to say here. I am also an alechmist who specializes in herbalism, so I had herb tracking on. I took the tip from the other poster who mentioned that they had beast tracking on and would hover over the marks on the map to see what beast they represented. I had done that and still walked around for a LONG time. I was about to give up hope and headed back towards Thunder Bluff to turn in for the night. I hovered over the marks to make sure that I wasn't missing anything and THERE SHE WAS! Thank the heavens above! I abandoned the temporary pet that I had tamed in the mean time (a level 5 wolf) and got to taming! Luckily the Mazzranache that I found was a level 9. I was worried I'd get a much lower one. She wasn't that hard to tame, although there were a LOT of other beasts around so I was worried I'd be getting attacked by something else while trying to tame her! I wasn't, and I had finally gotten my Mazzranache. I named her Roxette (but love the name Barbie that someone else came up with!) since that's what was playing on my playlist when I finally got her! I found her at 43, 42 in Mulgore, very close to the Thunderhorn Water Well. Best of luck to anyone else who wishes to tame Mazzranache! I love her so far! Found again at 47,43 this time while gathering herbs and not even looking to grind or tame anything. I actaully had the Mazzranache that I had tamed (see previous post) with me. All that it dropped was a Pioneer Belt (not even a green item). My alt troll ventured out to get him at lv 12, and after 45 minutes of searching, I tamed him without much trouble n.n He's awesome, and I get a bunch of comliments on him! He's fun to do eyes of the beast on and run around. If i could tame these as a nonhunter I would, but i had to start an alt hunter account to do this, sigh. I got my armor from this guy and have bumped into it at least 10 times. Shot of him in clear day light. Edit: someone said 1hour waiting and no respawn. Well, that's not so strange, other rare spawns have a spawntimer of about 12 hours. Some even have 48h. This little beauty if very fun for PvP. I mean whats cooler than your flamingo scattering about hunting down your enemys. Very slow however. If you enjoy him then you may also like his older cuisin the Strider Clutchmother. I journeyed as a NE to get him..for that stupid green chest he has...even though it isnt as good as my current armor..besides the +agi which is good for a rogue..i was lvl 19. Was camping for this guy at Thunderhorn Water Well by Mulgore tonite with my partner and went afk for a min. Came back and found it dead-my friend had to kill him as he spawned and agro'd big time and my friend didnt want to tame him. Was very dissapointed but kept camping and after about an hour it respawned and I nailed him. He shrinks alot but is a very pretty pink. Hehe! Two mega pets in one day This guy and the Rake! Was a good day! After possting this he spawned and agro'd us again! Maybe 10 minutes had passed. If anyone wants more into on location would be happy to help! Have this pet at level 60. Got her when I was level 60 (and she was level 9).Has taken a LONG time to get her here but she was worth it. Named her Corky :) Hopefully Bliz will put in a special feat for plainstriders in a future patch. I'm thinking a "kick" like ability would be awesome! And yes, no joke, people give me compliments on her everyday. Its Fabulous! Seeing it run around with Dash(Rank3) is quite hilarious. Just West of the goblin water well (and a tad North), on the right side of the road is where I found this beauty. Didn't do anything special, he just happened to spawn and I moused over the "dot" while tracking beasts. 2.0 attack speed, nothing special so far (I've only leveled him to 11 so far, with my 35 Hunter, hehe). BUT--he does look pretty freakin' cool. Got him the other day. About 2 hours respawn rate. Stat info at lvl 12 & 6 loyalty: str:33 agi:38 stam:28 int:23 spi:25 attack:60 power:46 damage:16-21 defence:60 armor:580. Hope this is helpfull to someone ^^ hes the cutest birdy you could ever have! I have this pet on my tauren hunter Cilitbang (yes I know the detergent is Cillitbang but that name wasn't available) and of course had to name the bird something pink and cleaning like, so I went for Vanish (since the jar is pink). Have had Vanish for 13 lvl's now (since I was lvl 10) and he/she is really cool and a rather nice tank. I won't swap him/her for a long long time... think my next tamed pet will be at lvl 60, when I'll go for Sian Rotam, the white lion in Winterspring. Get comments (all good) several times a day. And he/she really really looks cool. My NE hunter has Humar the Pride Lord still at lvl 60, and he's just GREAT aswell. Anyone have his stat info, HP AC & DPS @ lvl 9 6 loyalty? Just tamed this beauty a few days ago. Once I hit level 10 I ran from Auberdine through Ashenvale to the Barrens. I grabbed a disposable tallstrider pet while heading through Mulgore. I ran around for an hour looking for Mazz spamming the target macro I had made. When I finally found her a couple of low level tauren hunters killed her. So I logged out and came back the next day. Lucky for me Mazzranache was a few yards away from where I had logged out. I had to clear out a few mobs before taming her. Once tamed, she knows Cower Rank 1.
found Mazzranache at 37,44 at 8:30pm Pacific Time. ...figures...I'm only lvl 8, so by the time I get to lvl 10, I'll forget all about her and just go for the Rake. Just wanted a rare pet that LOOKS rare. My hunter, Drankk, has now had Mazz for 25 levels, being level 35 himself, and she's great! Lots of stamina, and nothing wrong with the damage, can learn Dash later making her even more useful... Just waiting for a chance to use her as main-tank in an instance, mwahahaha! The trip to Mulgore was intresting, as a dwarf. And once I finally got there, I saw her being killed by a tauren... after running around Mulgore waiting for her respawn for about 2 hours, I found her! No taurens to mess it up or anything, just ran up and took her! She's been with me since then, and I wont change to any other pet on this character! She spawned on me while I was on my level 9 Horde char. What a surpise it was to have one of the nice bird things start attacking me lol. I freaked out and killed it. I saw it was a rare monster but all I got was a pioneer cloak lol. After 3 hours and watching 4 seperate people kill this guy before I could reach him, I finally tamed him! I paid some people to help me get him, and from the time his corpse disappeared to when I found him it was 20 minutes. Met this fellow today, needed to go afk for a minute, parked myself in a safe spot on the road well away from nearby mobs... and came back to find myself dead.